Clumsy Guy is a minifigure that was released in 2016 as a part of 71011 Minifigures Series 15. Clumsy Guy has a white bandage wrapped around his head and Bright Yellow skin. He has thick, curved black eyebrows, black eyes and white pupils. Clumsy Guy has a worried, closed mouth. He has a nougat bandage on his bottom left cheek and a lavender bruise under his left eye. Clumsy Guy wears a azure short sleeved t-shirt, with a smirking banana picture on it, and dark blue trousers with a white cast on his left leg. The cast has various azure signatures and drawings printed on the front and on the side. The poor Clumsy Guy must have the worst luck of any Minifigure. No matter how safe and careful he tries to be, something always goes disastrously wrong. If there’s a banana peel around, he’ll slip on it every time. If someone has left a skateboard near the stairs, he’ll be in for a bumpy ride straight to the X-ray machine. Even when he’s standing in the middle of a crowd, he’s the only one who’s likely to get bonked on the head by a plummeting ice meteorite. 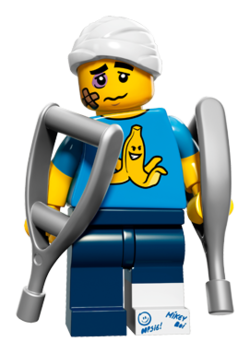 Fortunately for the hapless Clumsy Guy, LEGO® City has some of the best doctors and medical care around. Whatever bumps, bruises, scratches and dents he may receive during his misadventures, they’re ready to fix him up with casts, bandages, crutches and anything else that he may need to get him back on his feet and on the mend…right up until his next accident, anyway! This page was last edited on 28 August 2016, at 10:34.